OK, I get it, 90-minute Fingerless Gloves Crochet Pattern may not sound all that enticing when you’re looking for a quick project…but, seriously, these gloves are worth every minute. Perfect for the chilly days of Spring or for an office that never seems to get warm, these gloves don’t get in the way when texting, typing or taking photos. The off-set grit-stitch creates a lovely lace effect that makes these gloves a showstopper. 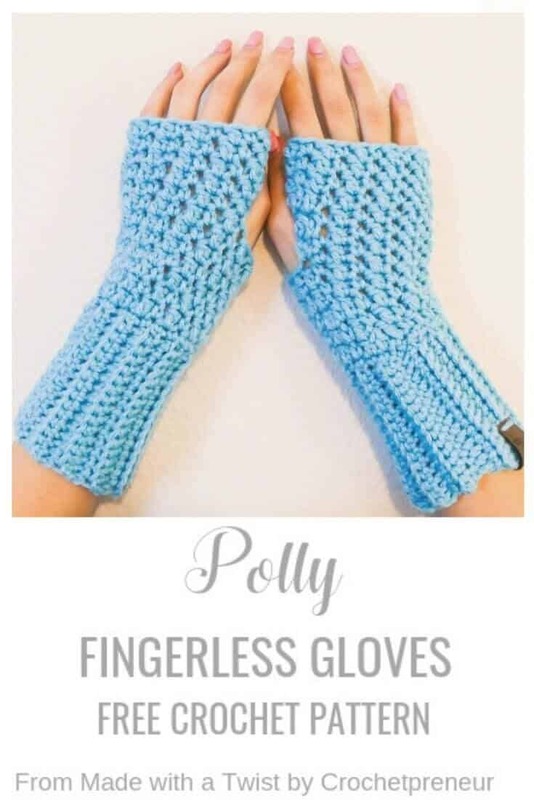 Pair them with other projects from my Polly product line and you’ve got a beautiful set that will take become a staple in your winterwear wardrobe. 7 ❁ CAN I SHARE YOUR PROJECTS? 170 yards of aran/worsted (4) weight yarn. I used Red Heart with Love (7oz (198 g) , 370yds (338m), 100% acrylic) in the Iced Aqua colorway. With (H) 5.00 mm hook, CH16. To complete ribbing: Fold ribbing in half so that rows 1 and 22 meet up. Matching the stitches, SLST rows 1 and 22 together. With yarn still attached, turn the ribbing right-side out so that the slst row is on the inside and your starting loop is at the top of the ribbing. Sew on your (aff link) product tag or other embellishments. Or, if you prefer not to subscribe, you can purchase the ad-free pattern from the Made With a Twist Shop. ❁ CAN I SHARE YOUR PROJECTS? Be sure to link your Ravelry projects to the Polly Fingerless Gloves listing and tag @thecrochetpreneur and/or @madewithatwist when you post you photos on social media so I can share your pics and show you some love!